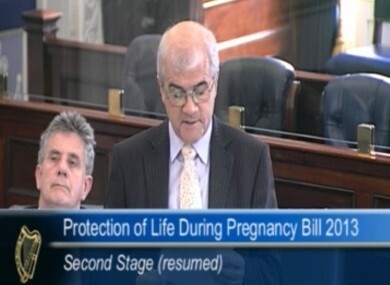 Jim Walsh was among those to contribute to the continuing debate on the Protection of Life during Pregnancy Bill this afternoon. SENATORS HAVE BEEN continuing their debate on the Protection of Life during Pregnancy Bill in the Seanad this afternoon with one Fianna Fáil senator warning that “once you open the door, it’s very hard to close”. Fianna Fáil senator Mark Daly did not explicitly say whether or not he would support the legislation but highlighted a series of concerns he has with the bill, pointing to evidence in the UK and the US where abortion regimes are more liberal than originally intended. “We all know, in our heart of hearts, that once you open a door it’s very hard to close,” he said, adding that there was “no easy answer, no answer that is 100 per cent correct”. He said that one-in-five pregnancies in England ends in abortion and said that the changes introduced in the 1960s had been used by pro-choice advocates to “move the boundary forward” and introduce a more liberal abortion regime. Senator Jim Walsh, also Fianna Fáil, said there was no evidence that abortion is a treatment for suicidality and claimed the bill is “anti-women”. “I oppose this legislation because it is anti-women, it dis-empowers women,” he said, claiming that women from poorer socioeconomic groups will be most affected by it. “Is this medieval, barbaric procedure the best we can offer a woman who has an unwanted pregnancy?” he said. Walsh later referred to actress actress Shelley Winters, who had regretted an abortion. He also said that singer Nicole Appleton and celebrity Sharon Osbourne had spoken of their “heartbreak” after obtaining abortions. He then graphically described the various methods of abortions. Earlier, Fine Gael senator Martin Mullins said he had asked for a free vote and for the legislation to be delayed but he accepted that the Taoiseach had a duty to uphold the Constitution. “I am taking a huge leap of faith in deciding to support the legislation,” he said, adding that he trusted women and doctorss that they would not circumvent the bill. Another Fine Gael senator Martin Conway said that women travelling abroad for terminations “has shamed us as a nation” saying that legislators had not dealt with the problem. Former Olympian Eamonn Coghlan , a Fine Gael senator, spoke of the abuse he had received at home and in work in recent weeks and months. The first vote on the second stage of the legislation is due at around 5pm. Read: Which Senators are going to vote against the abortion bill? Email “Fianna Fáil senator: 'I oppose this legislation because it is anti-women'”. Feedback on “Fianna Fáil senator: 'I oppose this legislation because it is anti-women'”.